The Handyscope HS6 DIFF measures with high resolutions of 14 and 16 bit. A signal measured with the Handyscope HS6 DIFF therefore has 256 times more resolution than most standalone oscilloscopes, which usually have a low resolution of 8 or 9 bit. 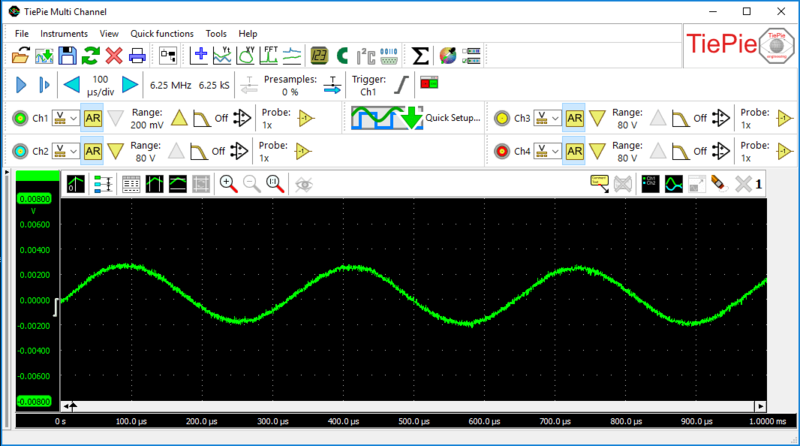 The high resolution of the Handyscope HS6 DIFF precision oscilloscope allows for measuring signals with more accuracy, because the quantization error is much lower. The input circuit of the Handyscope HS6 DIFF has a high accuracy of 0.25 % of the full scale input range, where most standalone oscilloscopes have an accuracy of 2 - 3 % of the full scale range. To display a signal measured with the Handyscope HS6 DIFF High Resolution oscilloscope at the same level of detail as the standalone oscilloscope, the display can be 256 times larger. 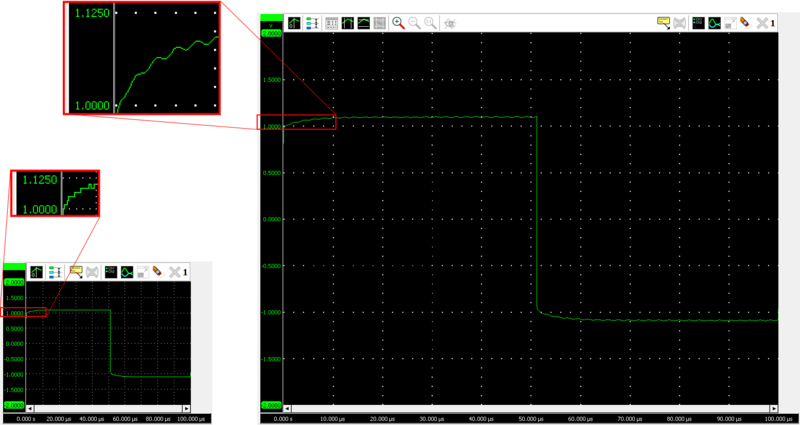 Viewing the signals on a 24" monitor immediately gives a very detailed impression of the signal. The smallest deviations are very well visible and because of the high resolution, it is still possible to zoom in and reveal additional details. Figure 1: Handyscope HS6 high visible accuracy compared to competition. The high resolution and high accuracy of the Handyscope HS6 DIFF and the unlimited zoom of the Multi Channel oscilloscope software allow to zoom in to mV levels. Figure 2 shows a measurement of a 2 mV sine wave made in the 200 mV input range, which is then zoomed in to view the signal at an 8 mV scale. With a time base accuracy of 1 ppm, frequency and timing can be measured very accurately. The time base of the Handyscope HS6 DIFF is 25 to 100 times more accurate than comparable instruments of the competition.